What started as refinishing and aging Historic Les Pauls has evolved after nearly a decade in business. 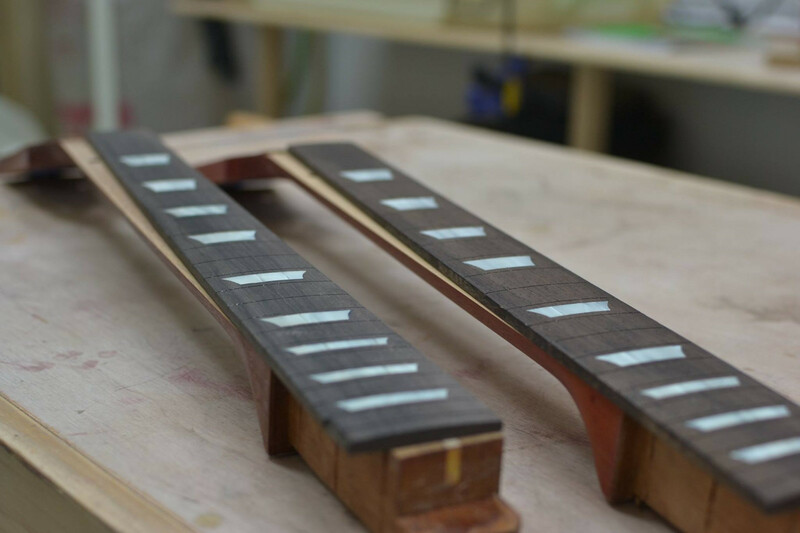 We have developed and refined our Makeover process to achieve the most authentic, vintage correct results for your guitar. Read on to learn how each step in the process takes your Historic or Reissue Les Paul closer to vintage spec. We adjust the contour of the maple top, referencing templates taken from a real ’59 Les Paul. The result is a carved top with softer lines and a more vintage look. The dimensions for our 50’s neck profile were taken from a real vintage Burst; in addition to the softer vintage correct taper, we remove the shoulders to form a more comfortable C shape neck. Historic Les Pauls from model year 2012 and earlier use Franklin style white glue for the neck joint. We remove the neck using a steam system and clean the old glue from the pocket. Then we reset the neck using old school hot hide glue. The look, feel, and sound of Brazilian Rosewood are essential to the character of vintage guitars. We replace the Indian Rosewood Gibson uses for their Historic fingerboards with finest quality Brazilian Rosewood blanks. Our material is selected for color and richness to give the most vintage correct look and feel. Every fingerboard is CNC cut to vintage specs for accuracy and playability, then inlayed, fretted, and bound by hand using vintage spec materials. We commissioned Mazzucchelli in Italy to custom fabricate actual cellulose nitrate sheets to the exact specs used by Gibson in the 1950’s. These sheets are custom laser cut to produce our exclusive vintage correct fingerboard inlay sets. Because these inlays are 100% vintage correct, they will shrink and darken in time, just like the originals. We start by removing the factory ABS cream binding. Then we re-bind the guitar with authentic Royalite binding. 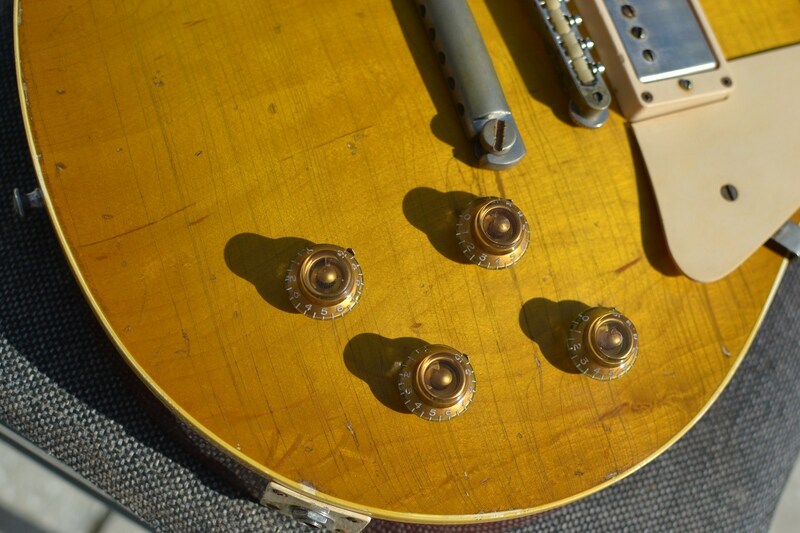 We use the same material that Gibson used on their guitars in the 1950’s and 1960’s. The color is a vintage correct bone white. 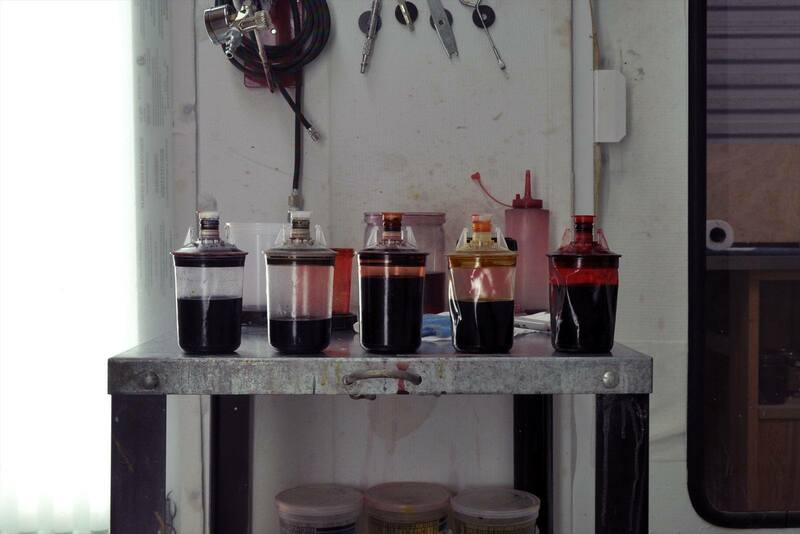 We hand mix the same aniline dyes Gibson used in the 1950’s. These dyes cause the classic Cherry Sunburst to fade to the now well-known Tea and Lemon bursts when exposed to ultraviolet light. If left in the sunlight, our finishes will fade just like a real Burst, leaving behind the distinctive unfaded areas below the parts. We have our lacquer custom mixed specifically for us, containing zero retarders or plasticizing agents; as a result our lacquer cures extremely quickly which means you get an old looking finish without 50 to 60 years of waiting. It also makes our finishes very hard and brittle, allowing for zero damping of the instrument’s natural resonance. Because of our specially formulated nitro, we can produce 100% authentic ‘cold checking’ that doesn’t just look real, but is real. When exposed to extreme temperatures, the air and moisture content in the wood causes it to expand and contract. This cracks the extremely thin and brittle layer of finish on the surface, resulting in the very fine ‘checking’ seen on almost all vintage instruments. 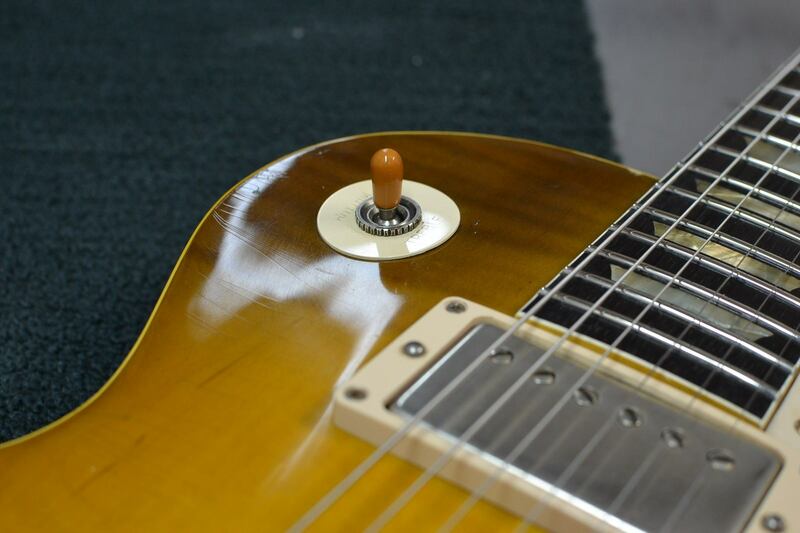 Every Deluxe Makeover also gets a new 6/6 nylon nut, for the most vintage tone possible. Nylon is a self-lubricating material, which saves strings and makes for more precise tuning and easier bending. Kim’s background in the screenprinting industry was put to good use making a reproduction “Les Paul MODEL” silkscreen. The font, thickness, and size of the text is an exact match. We print it directly on the headstock using a special gold ink on top of the finish, just like the originals. We re-stamp your guitar’s original serial number using a vintage spec typeface that was custom designed by us. The application is done by hand using an old school rubber ink stamp made for each individual guitar. For black guitars or walnut-back Goldtops, we use a white ink that turns yellow under the ambered clear coat. One of the final steps for each Deluxe Makeover is our meticulous in-house setup, which gives the guitar a comfortable “broken-in” feel, and ensures optimal playability and stability. 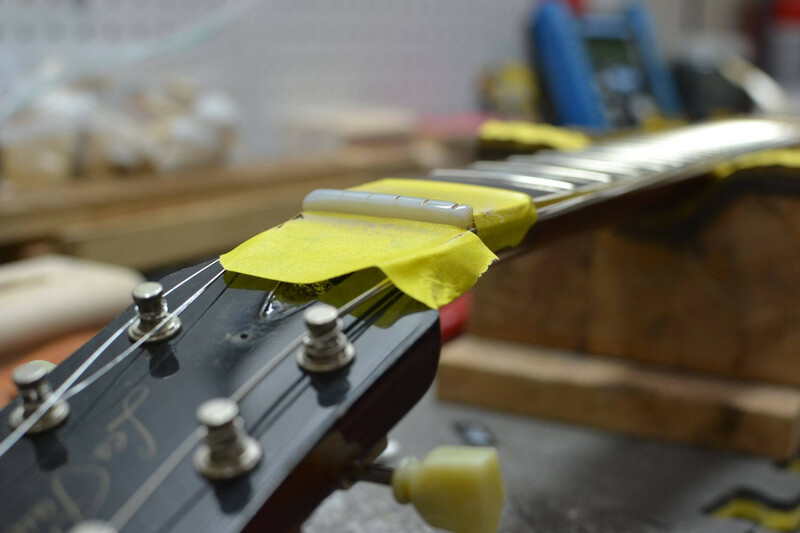 In addition to standard setup appointments, this step includes a full fret-dress, nut slotting, shaping, and polishing, as well as softening and beveling the fretboard binding edges for maximum comfort. Want to find out more? View our packages & pricing to see which options are right for you.